Racing ahead of Mark Cavendish's two autobiographies, American/St.Kitts and Nevis pro cyclist Kathryn Bertine, 37 years old, recently launched her third book. 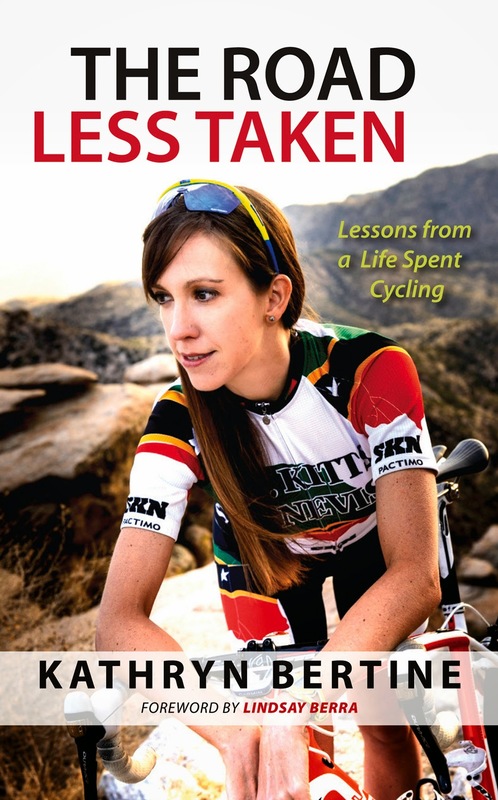 The first covered her career as a figure skater with an ice dancing company; the second was about her attempts to become an Olympic athlete in a range of unlikely sports but “The Road Less Taken” is a different book again, a series of episodes in her life as a professional cyclist and journalist. In it she travels not just a road less taken but one that leads in surprising directions. Kathryn Bertine appears to be a Force of Nature. Following her ultimately unsuccessful (but entertaining) attempt to get to the Beijing Olympics while writing for ESPN, she discovered her true sports love was not triathlon or rowing or distance swimming or pistol shooting but rather road cycling and to make it happen she became a citizen of the tiny Caribbean nation of St. Kitts and Nevis which she has since represented at several World Road Championships. Having designed her own national jersey. And arranged to get to various faraway countries to race. With no money or team support or much of anything, except an obvious unstoppable determination and more than a little talent and passion. She has been the national champion of her adopted country several times and raced for a number of women's professional teams, which gives her credible perspective, and her degree in journalism gives her the skill to capture these interesting stories in an elegant, personal style. She has become a documentary filmmaker with “Half the Road,” an eloquent argument for equality in women's cycling and sports in general. Her activism on behalf of her gender saw her, with pro racers Marianne Vos (3-time World Road Champion), Emma Pooley (former World Time Trial Champion) and Chrissie Wellington (4-time Ironman World Champion), successfully petition Tour de France organizers ASO to put on a women's race. La Course was run in Paris on the Champs Elysée this year, to the Arc de Triumph and back in 13 laps, covering 89 kilometres, on the final morning of the Tour de France before the arrival of the men's teams. Kathryn Bertine, without a team, received a last-minute invitation from Wiggle Honda and was able to taste the triumph of participating in a women's pro race on the grandest stage in cycling. There is a thoughtful piece on the Lance Armstrong legacy as well as some very personal stories about friends and family of which “the Pinarello,” about a racing bicycle hanging on a wall, its owner deceased, is most commendable. Sad but beautifully written. In spite of the awful hotel and lack of food, she somehow psyched herself up enough to race like a demon and in the end, although admitting to not being a big sprinter, managed a sixth place finish and taking eight points towards her dream of Olympic qualification. It is a glorious moment in the book but soon after everything lands with thud as the UCI rescinds all the points from the race and then fails to recognize her St. Kitts and Nevis national champion points due to a clerical error. The author is an ambitious and competitive athlete and the disappointment is palpable. The Olympic dream is over. Not everyone can win three World Road Championships like Marianne Vos or four Ironman World Championships like Chrissie Wellington but not everyone can look as critically at one's own life as an athlete and what that means in terms of pleasure gained, opportunities foregone and lesson learned as Kathryn Bertine has done in “the Road Less Taken.” And with the recent announcement of a three day women's race to run concurrent to the Amgen Tour of California, perhaps for women cyclists there will be a road more taken ahead.